Why Is General Mattis Nominating the 'Muslim Brotherhood's Stooge'? If nominated and confirmed, Patterson would hold the fourth most powerful position at the Pentagon — and would effectively be the top civilian in the Defense Department, since both Mattis and his deputy, Robert Work, were military officers. As ambassador to Egypt between 2011 and 2013, Patterson worked closely with former Egyptian President Mohammed Morsi and his Islamist government. She came under fire for cultivating too close a relationship with the regime and for discouraging protests against it — and White House officials are voicing concerns about those decisions now. Egyptians don't think very highly of Anne Patterson. This is putting it mildly. Back during the months leading to the June 30, 2013 revolution, Patterson — the "Brotherhood's Stooge" as she was called by all, from news analysts to the Egyptian street — was arguably one of the most hated individuals by the millions of Egyptians who took to the streets against Morsi and the Brotherhood. 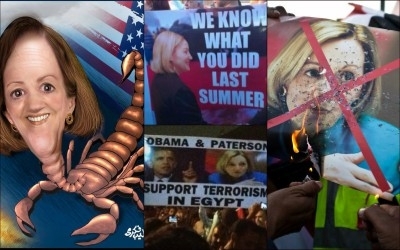 Not only did her face regularly appear next to Obama's in placards; it sometimes appeared alone, indicating just how closely she was seen as supporting the Brotherhood. It should be noted that these were not isolated sightings, as shown by the number of different placards and signs. Below are just a few anecdotes that I had translated from Arabic language media before, during, and after the June 30, 2013 revolution that highlight Patterson's unsavory ties to the Muslim Brotherhood. In the days leading to the revolution, Patterson called on Egyptians not to protest. She even met with the Coptic pope and asked him specifically to urge the nation's Christian minority not to oppose the Brotherhood — even though Christians were naturally going to suffer the most under Morsi, especially in the context of accusations of "blasphemy." Ambassador Patterson urged Coptic Pope Tawadros II and other Brotherhood opponents to support Morsi. [I]n fact, in my opinion, she is a member of the sleeper cells of the Brotherhood, likely recruited by Essam al-Erian or Muhammad al-Baltagi. Soon after the revolution, she repeatedly tried to reinstate the Brotherhood to power. Even Muhammad Heikal — "the Arab world's most respected political commentator," and for over 50 years an Egyptian political insider — said during a live interview that Patterson had assured the Muslim Brotherhood's Hisham Qandil, who under Morsi was Egypt's prime minister, that "there are many forms of pressure, and America holds the keys to the Gulf." And when Sisi rejected this order, the American ambassador began threatening him that Egypt will turn into another Syria and live through a civil war. Stop meddling in our affairs ... the Egyptian people are capable of looking after their own welfare. Because of all this, several of Egypt's revolutionary forces, including Tamarod, which played a pivotal role in the June 30 Revolution, staged protests in front of the U.S. embassy in Cairo "calling for the ejection of ambassador Anne Patterson." Anne Patterson's presence in Egypt has become a great burden for America, and Patterson should be admitted into a mental hospital for her deeds are full of bloodshed and the Obama administration is in a very awkward position in front of the whole world, the [U.S.] Congress and the Pentagon. Do you support the call to kick U.S. Ambassador Anne Patterson out because she interfered in Egyptian affairs? A whopping 87.93% said yes, 10.54% said no, and 1.53% were indifferent. Youm 7's audience is almost exclusively moderate, secular-leaning or Christian. It was the non-Islamists of Egypt that disliked the U.S. ambassador — not the Muslim Brotherhood, which benefited from her. In 2013, even Foreign Policy, a publication notorious for always siding with establishment D.C., noted that Patterson was widely seen among Republicans "as the key implementer for a policy that at least offers tacit support to the Muslim Brotherhood." Such is the person that General Mattis wants to place in a top Pentagon position.